Since last summer, T-Mobile has been offering free gifts to its customers each and every Tuesday – as part of the Un-carrier’s ongoing T-Mobile Tuesdays campaign. On June 6, T-Mobile will celebrate the campaign’s 1 year anniversary by giving away more free stuff than ever – “tens of millions of dollars in free stuff,” to be precise. 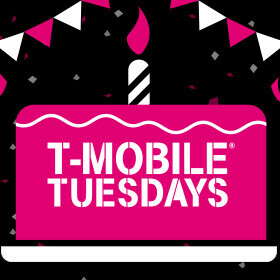 On June 6, folks who have the official T-Mobile Tuesday app installed on their phone will be able to receive gifts like $0.25 off Shell fuel, two free movie or game rentals from Redbox, and T-Mobile trucker hats. Moreover, on one of the four Tuesdays throughout June, every T-Mobile customer will receive free Baskin-Robbins ice cream up to $4 in value – you’ll have to check the T-Mobile Tuesday app weekly to see when it’s your turn. Even if you’re not a T-Mobile customer, the Un-carrier will have something for you, too. As T-Mobile puts it, “everyone, including those poor Verizon and AT&T customers,” will be able to enter a special 12-hour “thankathon” that will take place on June 6. The contest will be held on Twitter, with “epic prizes” being offered every hour. Further details will be announced soon. What about this T-Mobile Tuesday? Well, today, when you open the T-Mobile Tuesday app, you can get tickets to Wonder Woman, the very latest superhero film from Warner Bros., for just $4 – that’s about half the price of a normal ticket. The tickets are valid for any day of the movie’s opening weekend (June 2 – June 4). Also starting today, you can enter a Twitter contest for the chance to win a fabulous trip for four to Las Vegas to an event of your choice at T-Mobile Arena – check out the details at the second source link below.